When I see something that captures my eyes, particularly a piece by an artist, I'd often think about the stories behind and get curious about the process behind creating each piece. So this was what happened when I came about these beautiful pieces by Budapest-based artist, Tatjana Farkas the other day and was instantly captured by the beautifully wired faces, delicate, complex, twisted, as if she has something to say. I was also particularly drawn to her choice of medium - wire. 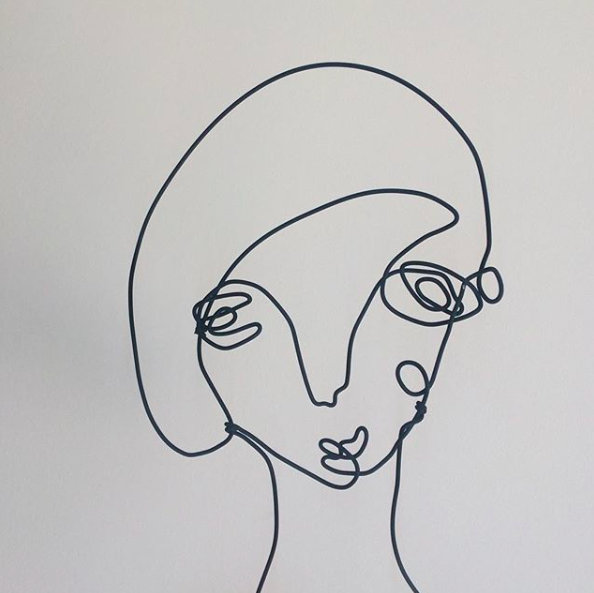 At first sight, I was drawn to the delicacy of how wire sculpture looks, thin lines drawing up the silent faces of a woman. But after hearing from Tatjana, to my surprise, it was because of the toughness of wire that she has chosen. This sort of brings me to think about women in general, female as a subject historically and presently. There's often an interplay between delicacy and toughness when we think about women, there are women that looks tough on the outlook but are often delicate emotionally, there are some that would surprise you with their inner bravery and determination, but certainly it is not up to me or anyone to confine what a woman should or shouldn't be. How did it all start? Tell us a little bit about your work, the choice of your medium - wire and your relationship with Hungary? As a child I drew and wrote all the time, or tortured the piano, I had a sort of artistic bug. But then I chose to study something more practical, so landed at law school. After getting my degree, I was travelling a lot and spent some time in Munich, London and New York. Regarding your question, I never considered myself truly as a Hungarian, more kind of cosmopolitan. I was born in the Ukraine, then spent most of my time in this country, but if I had the possibility I’d be travelling my entire life. Back to Hungary, as my first serious job I worked as an editor and journalist for design and lifestyle magazines, but I always felt working with my hands was missing. My first meeting with wire happened in a totally accidental way. I renovated my flat and had some extra wire and time. I started to mess around with those pieces and quickly realized, wire is a great medium to express my thoughts and ideas. It’s like a pencil, you can draw with it in 2 or 3 dimensions. I mainly work by hand, love the touch of the material, its toughness, the way how it forms into the shape or expression I dream of. The main part of my work is created in my mind, I have to think over the entire process before using my hands, because usually I use only one piece of wire. What's day-to-day life like for you as an artist? Although I have a very strict schedule, I tend to use my time flexibly. As I’ve got a home-based studio, it’s really hard to balance the private/work life. I’m bringing up two kids, which structures the days. Early mornings are the me-time and inspirational part of the day, it’s also because I’m really bad at getting up. I never get enough sleep, - hate the early hustle and bustle - so I spend more than an hour in my bed waking up, so this means I read, scroll through the net, answer emails, have coffee and cookies. After my kids leave for school, I walk the dog. My “work” starts at 9:30 and I work solidly till 4.pm. Part of my job consists of monotonous and mechanical issues, if so, I usually listen to podcasts while doing it. Otherwise, for creating sculptures I really need silence and peace around me. As I’m always short of time, inspiration usually comes weeks before making it real. But when suddenly the urge is there, I completely interrupt my other works, and create, create, create, sometimes even more pieces one after the other. Some days I leave the studio and meet clients, collaborations, have a business lunch. Late afternoons are always about family. I drive my kids to their programs, but my mind can never be shut down, while waiting for them or shopping at grocery store I think about my next projects. To wind down I run or take body art classes, it really helps to maintain my physical and mental health. I used to be a night owl, but not anymore, having a cup of tea on the terrace or watching a film is the best (maximum) I can do after 10 pm. In my daily life I gain inspiration from travelling, reading, watching films and visiting galleries. Women around me have also a great impact on me. Strong and sensitive females who have a difficult life and often difficult past. I try to catch the beauty of their struggle, the hidden sorrow, and the complexity of their soul with a minimalist approach. I was always very much interested in people’s past, where they are coming from, what kind of relationships have formed their present. I believe that everybody has a personal trauma that cannot be forgiven, forgotten and therefore it leaves its mark on our life. There’s always a slightly nostalgic atmosphere in my figure’s gesture, I try to express the life after “The”.